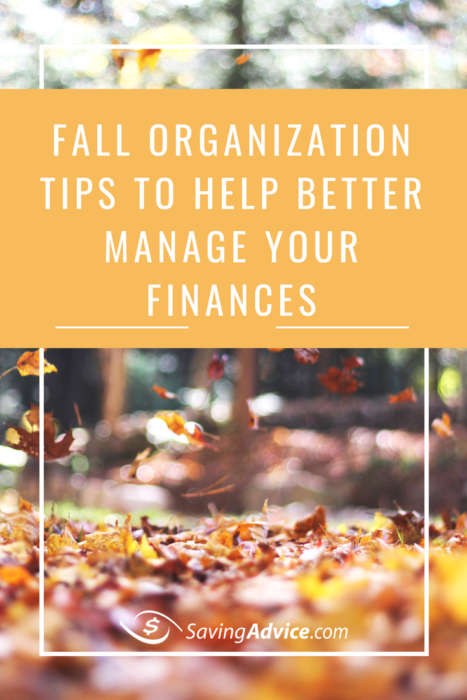 Fall Organization: Is Being Disorganized Keeping You Broke? In general, life is more expensive when you are disorganized. You wind up spending money on things you wouldn’t normally, blowing your budget, and going into debt. Here are a few fall organization tips to help you get your finances on track. Being disorganized can impact your finances significantly. First, disorganization can lead to serious financial problems is not being able to stay on top of your bills. For instance, you get nailed a late charge for your electric bill but you are sure you’d paid it. However, because you have no organization system for your finances, you missed making the payment. You simply don’t know when your money is coming or going. This type of disorganization can also lead you to make impulse buys. Consider this: you have had your eye on a new couch. Because your finances aren’t organized, you don’t save the money for the couch. One weekend, there is a great sale and, instead of getting your budget organized and saving up, you purchase the couch on credit (that you don’t really have). Now each month, for the next 24 months you have a payment due, that was unplanned. Also, having disorganized finances generally means you won’t have a plan to pay that debt off and no effective way of doing so. Eventually, you’ll find yourself drowning. So, how do you keep your finances organized and become more likely to reach your financial goals? Here are a few tips and habits to adopt this fall to better organize your finances. Get rid of stockpiled financial documents. 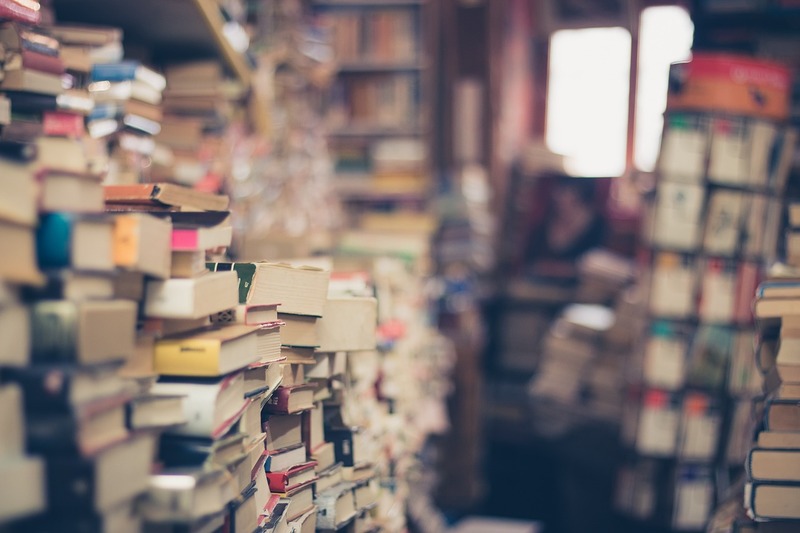 Having clutter can make it hard to get organized but the IRS makes people a bit nervous to throw away financial documents. You can safely shred and throw away any credit card statements that don’t include deductible purchases and are more than a month old. You can also trash utility bills, phones bills, receipts, deposit slips, and bank statements more than a month old (as long as you aren’t deducting anything). Make a digital copy. Once you’ve filtered through your documents, make digital copies of the ones you need and back them up. Keep your bills in one place. If you still get physical copies of bills, keep them all in the same place and create a way to track whether or not they’ve been paid. Check out this bill organizer. Develop a routine. Review your budget once a month and have a set day you review and pay bills each week. Having a set date and time will help you remain in control. It will also make sure everything is paid on time and you’re investing your money in the right places. Create a good environment for organizing your finances. When you handle your finances, create a desirable environment. Play some music or light a pumpkin scented candle (or the candle of your choice). Making your finances enjoyable will help you want to better manage your money. Use tools that are more aesthetically pleasing. If you are using a physical calendar or physical sorting of any sort, make sure it looks nice. This will also make you less reluctant to handle your finances. For instance, this planner has coloring pages. It would make it fun to review your budget each month. Create firm boundaries and set dates for reaching your goals. Don’t allow yourself a whole lot of wiggle room when it comes to your budget and setting goals. The more room you give yourself, the less likely you’ll be to stick to your budget. These are just a few organization tips to adopt this fall to better manage your finances. Do you have a tip you’d add to the list? Let us know in the comments! A Life Without Debt: Am I a More Organized, Responsible Person? You have too much junk. I feel pretty confident making that statement because I have far less stuff than most people, and I have way too much junk. This became apparent as I was going through stuff as part of my 52 week make money challenge. As part of that challenge, I am hoping to sell some of the things I have but no longer use, in order to make some extra money . While that’s still a goal, as I’ve been going through the garage I’ve been finding far more things than I realized I had. It’s become obvious that what I really need to do is a major decluttering. The problem I have with decluttering is the same problem that a lot of people have with saving money. Over the years I’ve formed the habit of saving stuff “just in case,” rather than selling it or getting rid of it in some other way. 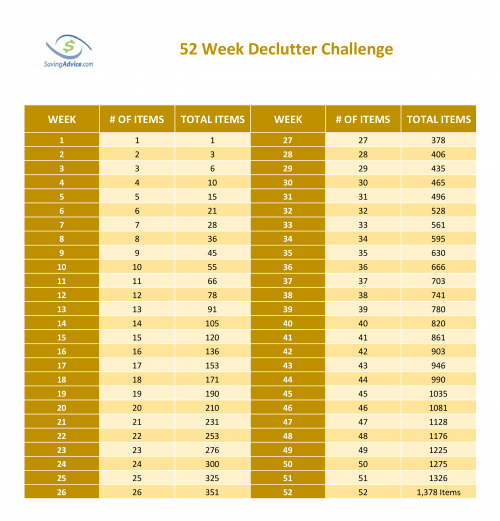 It’s a habit that I need to break, and it seems that a great way of breaking it has been staring me straight in the eyes: a 52 week declutter challenge. Over the next year, I plan to rid myself of 1,378 items from my house. The concept is pretty simple. For each week of the year, I’ll get rid of a corresponding number of things from my home. For example, in week one I’ll get rid of a single item. In week two, I’ll let go of two separate things. In week three, three items would vanish from my house. This will continue until week fifty-two when I’ll remove 52 things from my house. Doing this on a weekly basis will have me purging a total of 1,378 items during the year. I’ve created the handy chart below so that I can track the purging (and you’re welcome to as well), and make sure that I stay on top of the challenge. While the standard declutter challenge is a perfectly acceptable way of going about the challenge, I think that I’ll actually do the alternate version. I’ll be getting rid of the same amount of stuff, but this version gives me the option of choosing how much I purge from my home each week. 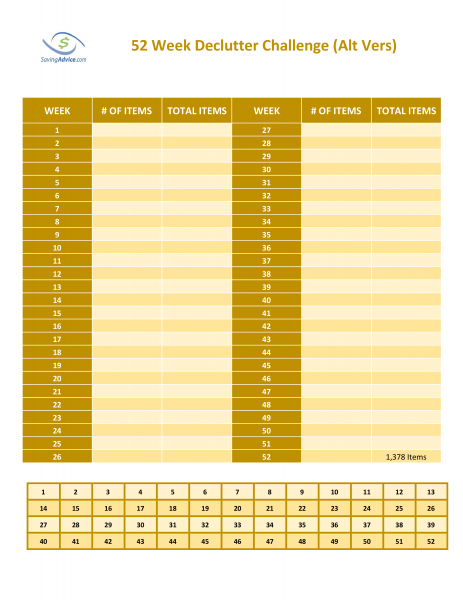 At the bottom of the chart are numbers from 1 to 52, one for each week in the year. Each week, I’ll keep track of the number of things I have disposed of and cross that number off the bottom of the chart. I’ll then write that number next to the week. 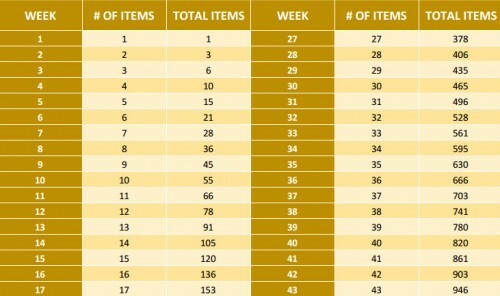 For example, if I get rid of 23 items in week one, I’d write 23, and then 23 for the total number of items decluttered. Then in week two, if I disposed of 12 items, I’d write 12 next to week two, and then add that 12 to the 23 items from week one, for a total of 35 things removed from the house. I think this version will give me more flexibility and a greater likelihood of achieving the goal. I know that I tend to be more motivated to tackle clutter at certain times over others, and when I’m in this mood I can cross off the higher numbers. When I’m not as motivated, or when I become extremely busy on other projects, I can purge a smaller number of items. 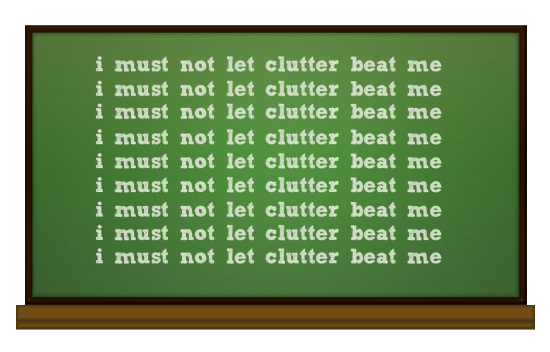 There is a wonderful thread in the forums that has been ongoing for a number of years which is devoted to people explaining what they have decluttered. If you are having trouble trying to figure out where to start and what you should get rid of, then this is a great place to begin. I’m excited to embark on this challenge and reap all the benefits that come with reducing the amount of stuff that I have. 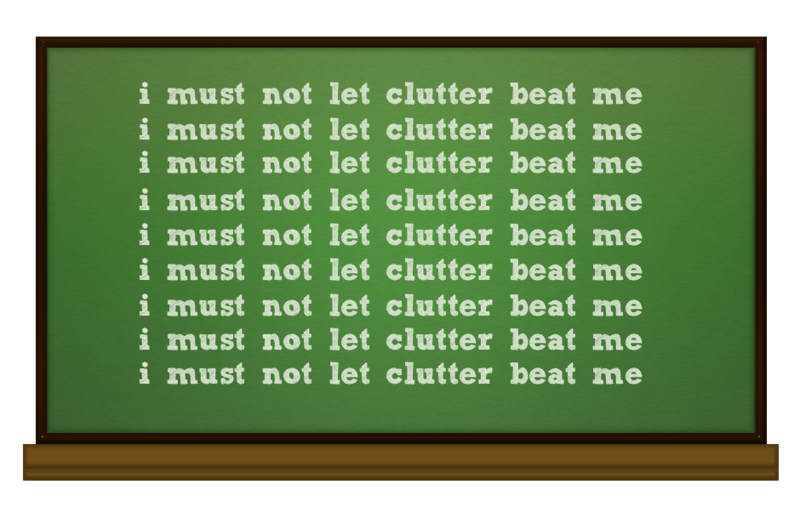 Please feel free to print the charts for yourself if you know that decluttering is something that you need to do this year. If you know someone who would benefit from this type of challenge as well, please pass it along the them. I think this should be a fairly simple and straightforward way to declutter, and I also hope it helps others that need to do the same. It’s hard to get out of debt. Sometimes it’s easy to feel that no matter how hard you try, you’ll never be able to pay off all your debt and expenses. While you might have reassessed your finances and figured out how to begin paying down your debt, it’s important to understand how to minimize debt in all areas of your life. 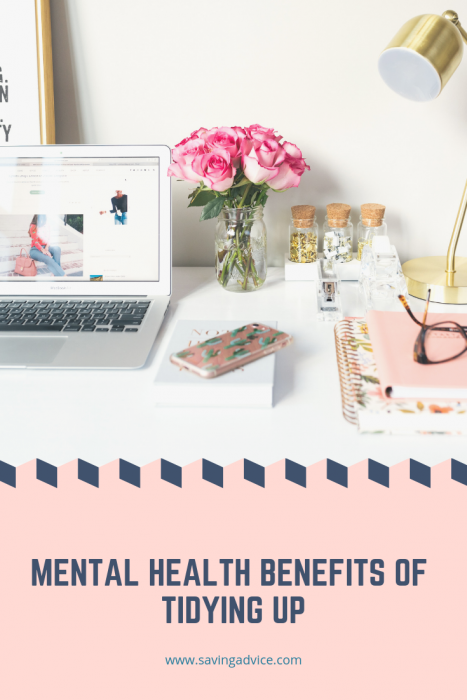 For instance, you might not even realize that you have a variety of daily habits that are keeping you buried in debt despite your best intentions. The following are a few of the more common ones. It’s easy to spend more money than you have whether it’s by writing a check, swiping a card, or willfully ignoring the decreasing amount of money in your bank account. Just because you have money in your bank account, it doesn’t mean you have to spend it as it many times has already been allocated for other recurring expenses. 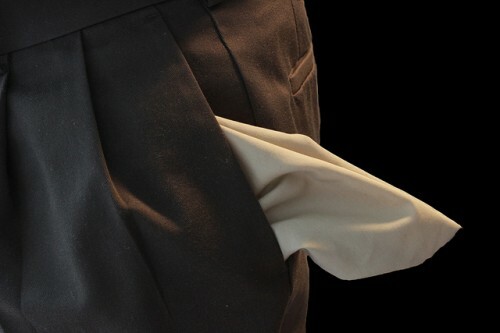 Fooling yourself into believing that if there is money in your bank account at the moment that it’s OK to spend it is an action that will continue to keep you in debt. Impulse purchases are one of the worst habits keeping you in debt. You might really want to stop and get that pastry or that new tech gadget or piece of clothing, but actually buying those items on a whim is contributing to your debt. If you tend to make impulse purchases on a daily basis, you should take steps to seriously curb this habit so that you don’t put yourself into even more debt. Buying things you already own is also contributing to your debt problem. Do you need to buy lunch or dinner at a restaurant or takeout place when you have food in your house or apartment? Do you need to buy coffee when you can make it at home? Do you need to stop and pick up more clothing when you have a closet full of clothes with the tags still on? Stop buying things you already own and focus on using what you have. If you find that you are purchasing things without realizing that you already have them, it might be time to declutter your house. Buying things you don’t need is another problem for anyone already in debt. As with buying things you already own, the problem of buying things you don’t need just contributes to wasting money you should be saving. When you make a new purchase each day, reassess whether or not you really need that item. Instead of buying it without a second thought, take a moment to determine whether or not you’re wasting money on something you don’t actually need. Sometimes the problem with spending too much money is that it’s easy to swipe a card and figure out how much was spent at a later date. When you carry cash, you’re limited to the amount of money you can spend on one purchase. While it’s great to have a credit card for emergency purchases, using one for everyday items could be the reason why you’re racking up the bills. Try only using cash for daily purchases so you can limit how much you buy and reassess what you’re buying. While some people may consider this a burden, tallying your daily purchases is a good way to recount how much money you’ve spent in one day. Chances are you’ll find that you’re spending a lot more money than you need to be spending each day. This can help you figure out how to eliminate money from your daily spending habits. Putting a little money aside each day is a great way to help your debt problem. It doesn’t have to be a large amount of money. It can be anything from spare change in your wallet to a dollar a day. A small amount goes a long way when it comes to saving and anything you can do each day to contribute to paying down your debt is worth it. Budgeting isn’t only for monthly or yearly financial plans. You can set a budget on a day by day basis. This might seem like a hassle for some people, but it’s a great way to keep you from overspending or wasting money on impulse purchases. Not being consistent with your money habits is another big reason why you’re still in debt. It’s easy to make a huge deposit into your savings account one month, but to not save for the other eleven months. Consistency will help keep you on track with your savings plan. One of the worst things you can do to your finances when you’re in debt is not knowing how much money you actually have. If you’re not aware of the amount in your bank account, you run the risk of spending money you don’t have. Knowing how much money you have will allow you to keep better track of your spending habits and help you steer clear of falling even deeper into debt.